The official unveiling of this magnificent eagle feathers sculpture by Cork based sculptor Alex Pentek took place on Sunday June 18 2017 at Bailic Park, in Midleton, Co. Cork. 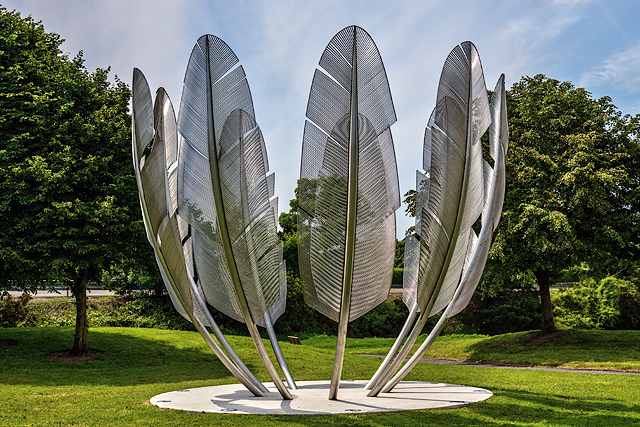 Commissioned by the former Midleton Town Council, the 'Kindred Spirits Monument' commemorates the generosity of the native North American Choctaw Indian Nation during the Great Hunger in Ireland of 1845 - 1851. Moved by news of starvation in 1847, a group of Choctaws in Oklahoma organised a relief fund from their own meagre resources, raising $170 to forward on to the US famine relief organisation. It was a show of solidarity with the Irish people, having suffered a similar fate themselves just 16 years before after they were forcibly removed from their ancestral lands. The official unveiling was attended by the chief of the Choctaw Nation, Chief Gary Batton, and a delegation of 15 Choctaw representatives.